Save up to 60% on Winter Sale. Expires on 01/02/2015. Save up to 50% on select items. Expires on 08/31/2015. Get 10% off orders over $100 + Free Shipping. Expires on 08/31/2014. Get $10 off orders over $100 + Free Shipping. Expires on 08/31/2014. Save 20% on regularly priced merchandise + free ground shipping on orders over $79. Expires on 08/22/2015. Mens Surf & Skate Clearance! 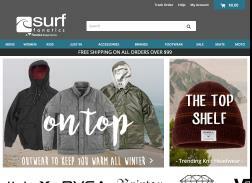 Save up to 50% on select Mens Surf & Skate apparel. Expires on 11/06/2014. Save 15% on your purchase and receive free ground shipping in the United States. Expires on 10/22/2015.